The proposed venture is an independent specialty bakery named the Whole Grains. The company’s specialty is ‘bread with bits’ having unique tastes and a higher nutritional value as compared with other conventional breads. The breads will be produced in-store and sold directly to customers. The company will be established as a partnership. One of the partners, a seasoned practitioner with 15 years’ experience in the bakery industry, will occupy the position of a Managing Director and be fully responsible for running the enterprise. The volume of the UK bakery market is estimated at 4 billion units and £3.6 billion, which makes it the largest food industry in the country (FOB, 2018). The segment of craft bakeries, which are typically located at high streets, generates about £180 million in revenue per year (FOB, 2018). Despite its relatively small size, the specialty bread segment is one of those fastest-growing, increasing by 3.3% in 2016 against the backdrop of the overall market decline (see Figure 1). The compounded annual growth rate (CAGR) in the branded bakery segment was 4.4% over 2014-2017, and the number of outlets increased by 2.5% (Wallin, 2017). The healthy industry outlook contributes to the optimistic expectations of the venture’s profitability (see Section 6.3). As presented above, the ongoing decline in the bakery product sales is mainly driven by the falling consumption of wrapped bread, while the specialty bread segment exhibits a decent growth (Kantar Worldpanel, 2016). This pattern is promoted by the rising health consciousness among British consumers. Specialty breads are perceived as healthier as they contain less sugar (Eagle, 2015) and also can be gluten-free or accommodate other special dieting preferences such as vegetarian or organic (Cooke, 2017). 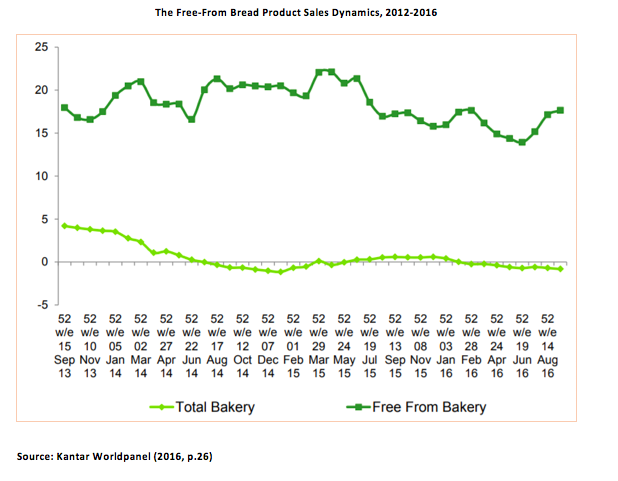 The most impressive growth was observed in the ‘free from’ bread segment, which recorded an increase by 15.4% for 20 consequent quarters (see Appendix). However, the greatest and largely unexplored opportunities, according to the research report by Mintel (2017), exist in the ‘bread with bits’ segment with a strong use of herbs and spices that can enhance the taste and health credentials of the product alike. This up-to-date research data is the main reason behind selecting ‘bread with bits’ as the proposed venture’s specialty. The target audience of the proposed venture is educated professionals aged 35-54 with above-average income who work in the banks and offices at York Road where the store will be located (see Section 5.1). 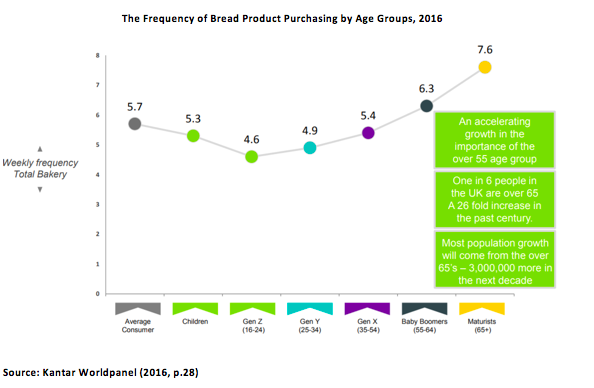 According to Kantar Worldpanel (2016), the 35-54 age group consumes about 5.4 bakery units per week, which is a significantly higher purchase frequency than among those aged 25-34 and 16-24 (see Appendix). The next important customer audience is tourists, including business travellers. In 2016, Leeds received 26 million tourist visits, which is an increase by 5.3% since 2013 (Yorkshire Post, 2016). 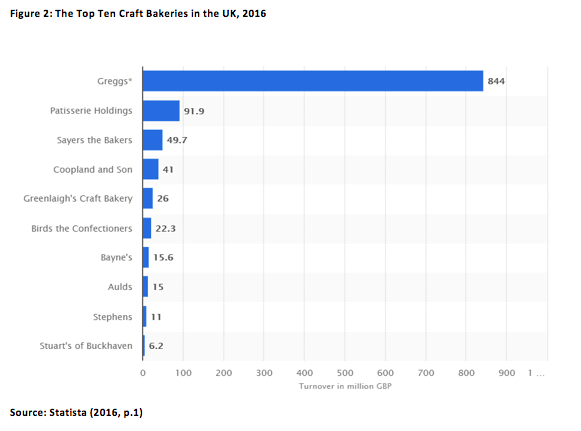 The craft bakery segment is technically dominated by a single large player, Greggs, which accounts for about 70% of the market (see Figure 2). Other strong artisan bakery brands are Paul, Le Pain and Gail’s (Wallin, 2017). However, the high perishability of bread products limits the reach of competition (FOB, 2016). Customers prefer buying from bakeries in their immediate location, which opens ample opportunities for small independent stores. The proposed venture will have no direct competitors in the York Road area in Leeds where it will be located. Although there are several other bakeries such as The Old Bakery and Janes Cakes (see Section 5.1), none of them has the same specialty. The substitutes for the venture’s product include the non-bakery breakfast and lunching choices, such as cereals, yogurts and fruit. 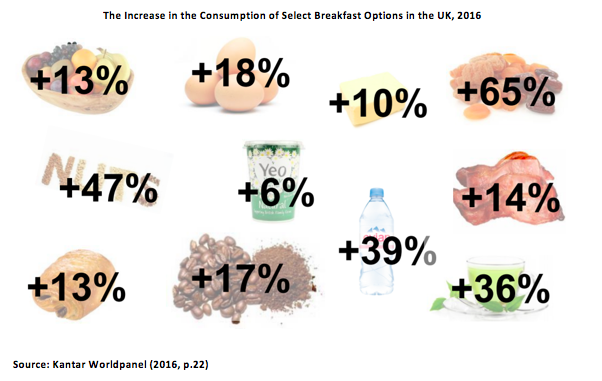 These are growing increasingly popular with British customers (see Appendix), while the overall consumption of breads is declining (Butler, 2017). The proposed venture will combat these indirect competitors by convenient location and product uniqueness. The main ingredient used in the bread production is wheat, which is by 85% sourced within the UK (Butler, 2016). The wheat prices followed a declining trend during 2012-2015 (Kantar Worldpanel, 2016), but increased by 24% over the past two years, which imposed a considerable cost pressure on conventional bakeries (Butler, 2017). However, the increasing commodity costs are not the major concern for the proposed venture because of its premium pricing and high profit margins (see Section 4.1). The USP of the proposed venture is the range of specialty ‘breads with bits’ recipes that make use of health-boosting herbs and spices. This product feature aligns with the influential positive nutrition trend (Mintel, 2017) and the diversity-seeking motive of specialty bread consumers (Butler, 2017; FOB, 2016). The proposed venture’s marketing mix includes the product, price, place and promotion dimensions (Kotler and Armstrong, 2014). The product dimension was described in Section 3.4, while the place dimension will be covered in Section 5.1. The price of the bread products will be set at £3-7 per unit, which is significantly higher than the mass market bread prices in the UK (Smith, 2018). This pricing will secure the profit margin of 25% (see Section 6.1) and incorporate a premium for the uniqueness and hedonic value of the product. The promotional mix will incorporate advertising campaigns on Facebook and Instagram, which were selected as the most popular social networks in the UK (Ofcom, 2016), and the distribution of flyers in the nearby business centres and out in the streets. The flyers will provide a 10% discount on the first purchase. Coupon promotions were established as a particularly effective method for start-up ventures in the food industry (Gao and Chen, 2015; Mattila and Gao, 2016). 1,000 bread units sold per week. 4,000 bread units sold per month. The bakery will be opened at the intersection of the York Road and the Osmondthorpe Lane. This area has a busy traffic flow and is situated just about five kilometres away from the city centre, yet the spot has not yet been occupied by any rival bakery (see the figure below). 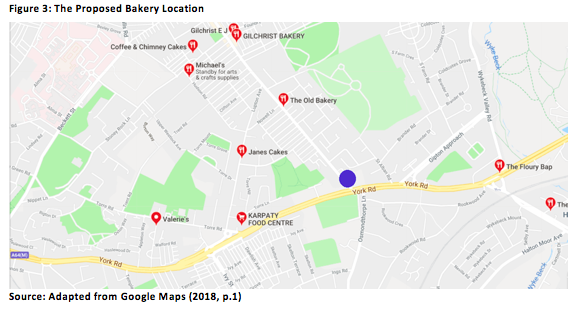 As shown above, the proposed location (marked with a blue circle) is at a considerable distance from other bakeries in the same city area, including The Old Bakery in the north, Janes Cakes and Valerie’s in the west and The Floury Bap in the east. 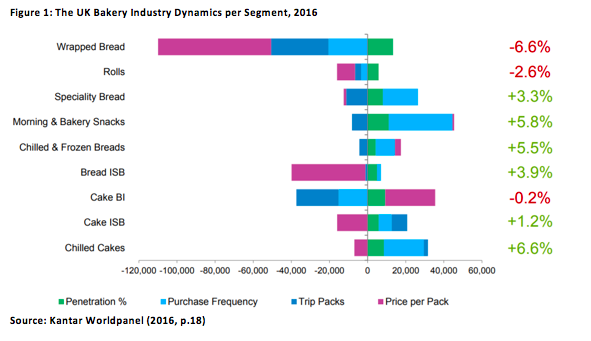 Considering that bakery products are often purchased spontaneously and customers would rather buy them at the spot than travel an extra mile (FOB, 2016), this location will set the Whole Grains ahead of the immediate competition. The production of high quality specialty breads will require purchasing sophisticated and high-quality equipment. The estimated cost is given in Section 6.1. Within the first year of operation, 2 baking staff members and 2 shop assistants will be hired. The managerial and IT functions will be handled by the partners. The accounting operations will be outsourced. The salary estimate is provided in Section 6.1. 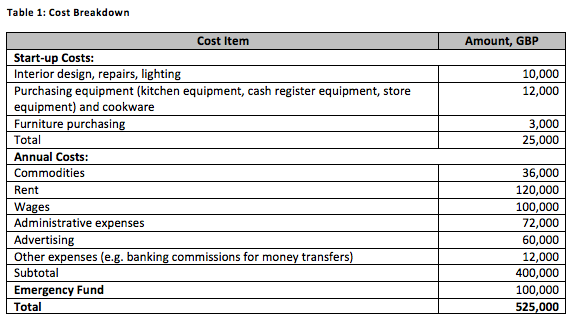 The estimated breakdown of start-up and first year costs is provided below. As shown above, the total cost of setting the venture up and operating it during the first year is estimated at £525,000. Allocating 20% of this amount to the emergency fund is consistent with best practice in business planning (Mariotti, 2014). The break-even point forecast is provided in the table below. As shown above, the break-even point will be achieved after selling 100,000 bread loafs, or within the first two years of operation. The limitation of this analysis is that it relies on the assumption that costs remain stable over the two years and no major inflation or pound depreciation occurs. The project annual revenue of the venture is £480,000, which can be accomplished within the first year provided that the sales targets are met. 70% (£360,000) contributed by the partners. 30% (£165,000) as a banking loan. The proposed venture is aimed at addressing the UK customers’ growing demand for healthy and nutritional bread products with novel and exciting flavours. The demand forecasts and revenue projections are grounded in market research reports and the founders’ practical experience in the bakery industry. The major limitation of this business plan is the assumption of unchanged operating costs within two years. Butler, S. (2016) ‘From Marmite to bananas: how sterling swings will affect prices’, [online] Available at: https://www.theguardian.com/business/2016/oct/13/marmite-bananas-sterling-swings-prices-consumers-shopping [Accessed on 15 January 2018]. Butler, S. (2017) ‘As sliced bread sales fall and costs rise, are UK’s leading bakers toast?’, [online] Available at: https://www.theguardian.com/business/2017/nov/11/are-uks-leading-bakers-toast-bread-sales-fall-costs-rise [Accessed on 15 January 2018]. Cooke, A. (2017) ‘Do you know the bakery trends of 2017?’, [online] Available at: https://bakeryinfo.co.uk/news/fullstory.php/aid/17292/Do_you_know_the_bakery_trends_of_2017_.html [Accessed on 15 January 2018]. Eagle, J. (2015) ‘UK bakery market to grow by 9% by 2020’, [online] Available at: https://www.bakeryandsnacks.com/Article/2015/10/12/UK-bakery-market-to-grow-by-9-by-2020 [Accessed on 15 January 2018]. FOB (2016) ‘The British bakery market: factsheet’, [online] Available at: https://www.fob.uk.com/wp-content/uploads/2016/11/FS-3-UK-Bakery-Market.pdf [Accessed on 15 January 2018]. FOB (2018) ‘UK bakery market’, [online] Available at: https://www.fob.uk.com/about-the-bread-industry/industry-facts/uk-bread-market/ [Accessed on 15 January 2018]. Gao, F. and Chen, J. (2015) ‘The role of discount vouchers in market with customer valuation uncertainty’, Production and Operations Management, 24 (4), pp. 665-679. Google Maps (2018) ‘Leeds bakeries’, [online] Available at: https://www.google.com/search?tbm=lcl&ei=6mlcWuCfII_bwALcsYzADg&q=leeds+bakery&oq=leeds+bakery&gs_l [Accessed on 15 January 2018]. Kantar Worldpanel (2016) ‘The bakery market’, [online] Available at: http://britishsocietyofbaking.org.uk/wp-content/uploads/2016/08/The-Bakery-Category-Matthew-Verity-Kantar-Worldpanel-13-October-2016-1.pdf [Accessed on 15 January 2018]. Kotler, P. and Armstrong, G. (2014) Principles of marketing, 15th ed., Harlow: Pearson Education. Mariotti, S. (2014) The young entrepreneur’s guide to starting and running a business: turn your ideas into money, New York: Crown Publishing. Mattila, A. S. and Gao, Y. (2016) ‘An examination of popular pricing and price framing techniques in the hospitality industry and directions for future research’, International Journal of Revenue Management, 9 (2/3), pp. 175-185. Mintel (2017) ‘Bread and baked goods – UK’, [online] Available at: http://store.mintel.com/bread-and-baked-goods-uk-october-2017 [Accessed on 15 January 2018]. Ofcom (2016) ‘The communications market 2016: internet and online content’, [online] Available at: https://www.ofcom.org.uk/__data/assets/pdf_file/0023/26393/uk_internet.pdf [Accessed on 15 January 2018]. Smith, A. (2018) ‘The price of a loaf of bread has gone up by 20p and bakers are blaming Brexit’, [online] Available at: http://metro.co.uk/2018/01/14/the-price-of-a-loaf-of-bread-has-gone-up-by-20p-and-bakers-are-blaming-brexit-7227412/ [Accessed on 15 January 2018]. Statista (2016) ‘Leading ten craft bakers ranked by turnover in the United Kingdom (UK) in 2016’, [online] Available at: https://www.statista.com/statistics/297854/biggest-craft-bakery-retailers-ranked-by-turnoverr-in-the-united-kingdom-uk/ [Accessed on 15 January 2018]. Wallin, J. (2017) ‘UK bakery market to reach £1.4bn in 2017’, [online] Available at: https://www.bighospitality.co.uk/Article/2017/10/02/UK-bakery-market-to-reach-1.4bn-in-2017 [Accessed on 15 January 2018]. Yorkshire Post (2016) ‘Why Leeds is Yorkshire’s new tourist destination’, [online] Available at: https://www.yorkshirepost.co.uk/news/why-leeds-is-yorkshire-s-new-tourist-destination-1-8106514 [Accessed on 15 January 2018].